New Which? Travel research has found that in the event of a no-deal Brexit, Alicante airport in southern Spain would need the staff and resources to deal with an estimated additional 201 hours of immigration checks on British passport holders, on average, every single day. Potential delays for British holidaymakers arriving at their destination would be due to the extra border checks required by Brussels if the UK leaves the EU without a deal. This would automatically make UK passport holders subject to the same checks as third country, non-EU arrivals to Schengen Area countries such as Spain, France and Italy where there are no border controls for EU citizens moving between them. The European Tourism Association (Etoa) has estimated that these checks add an extra 90 seconds for each UK passport holder. To put that in context, it would take a single passport lane an extra 17,010 seconds – nearly 5 hours – to process the 189 passengers on a single Ryanair flight, if all those passengers were UK passport holders. And with each new arrival throughout the day, that additional processing time will lead to further delays. Alicante airport currently copes with more than 8,000 UK arrivals on average per day. There are also some incredibly busy periods. When we checked Alicante airport’s arrivals on 22 February, we found as many as 10 planes arriving from the UK, in a single hour. 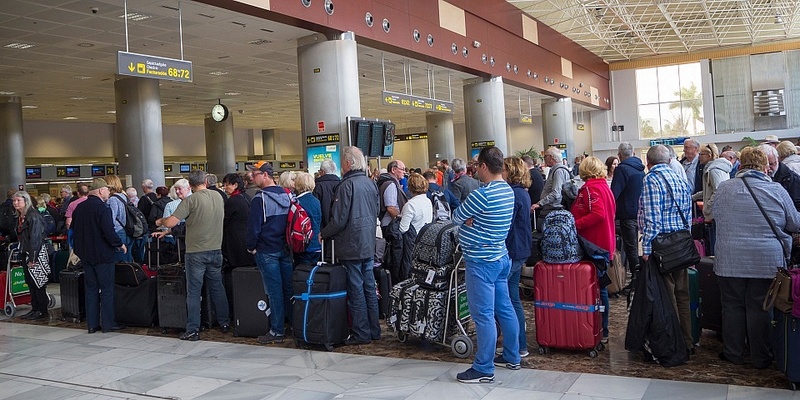 Unless a reciprocal agreement is struck, or more staff and resources are put in place, UK travellers will face queues many, many hours long on arrival at Alicante and other popular Schengen Area airports after 29 March. Which? has identified the airports where UK passport holders are mostly likely to face disruption. Below are the Schengen Area airports where UK arrivals makeup the highest proportion of all international arrivals. Some of these UK arrivals won’t be British. They may be Spanish or Portuguese nationals returning home, for example, and they therefore won’t be subject to additional checks. However, given the airports at the top of the list are the most popular UK holiday destinations, it’s likely to the vast majority of passengers will be UK passport holders. Half of all arrivals to Faro airport are from the UK. However, the Portuguese prime minister has announced plans to open special fast-track lanes for UK passport holders at both Faro and Funchal airports. That means Alicante airport is where UK holidaymakers are most likely to face longer queues this summer. Some 43% of all arrivals are from the UK. The estimated 201 hours of immigration checks needed each day at Alicante could require as many as 25 new staff and passport lanes. Spanish airports will be particularly affected by the new rules. Six of the 10 busiest airports for UK arrivals are on mainland Spain or its islands. Tenerife South, Lanzarote, Malaga, Ibiza and Palma de Mallorca airports also face severe disruption without a contingency plan to open new lanes, or employ more staff. The Spanish government has yet to announce how it will tackle the additional immigration requirements. We asked Spain’s national border agency, the Guardia Civil, whether it plans to add extra facilities or employ more staff, but it has yet to respond. A spokesperson for the European Commission confirmed to Which? that ‘as of the withdrawal date, UK nationals will not be entitled to use the separate lanes provided for EU/EEA/CH citizens’. It also stated that British holidaymakers ‘will be subject to thorough checks of all entry conditions for third country nationals upon entry’. Rory Boland, Which? Travel editor, said: ‘Airports can be chaotic at the best of times, but if additional checks at passport control in Spain, Italy and other popular EU destinations are implemented in the event of a no deal, it seems that very long queues are going to be an unwanted side effect.